In a small Welsh town, deep in the valleys, lies a community in trouble. The year is 1984 and the people of Onllwyn are struggling to cope during the miner’s strike. The difficulties facing these miners is then recognised by a group of people in London who decide to raise awareness and money to help. The group - Lesbians and Gays Support the Miners (LGSM) - decide to take the money that they have raised to Onllwyn - but are the people there ready for their visit? I’m always nervous when a film is described as “this year’s The Full Monty” or “the next Billy Elliot”. I find these descriptions quite off-putting. So I admit to feeling a bit wary when I started to watch Pride. However, those reservations soon melted away as I found myself unable to resist this wonderfully uplifting film. 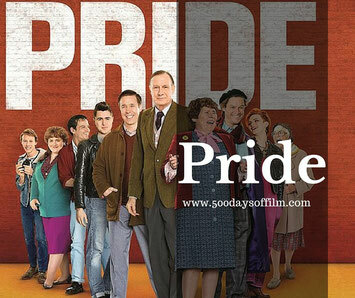 Pride is based on a remarkable true story. It is one of those life is stranger than fiction tales - for who could make up such an unlikely union? However, the film's powerful storytelling makes the solidarity that grows between these two groups easy to understand. LGSM sees that the mining communities are being bullied just as they are being bullied. They recognise the struggle and alienation felt by the miners. Their decision to act is, of course, no less admirable for this connection. In addition to its powerful story, Pride benefits from a fantastic cast. In London, Ben Schnetzer is fantastic as LGSM’s leader, Mark and George MacKay delivers a brilliant performance as Joe. Meanwhile, the relationship portrayed by Dominic West and Andrew Scott is both hilarious and really moving. In Wales, Paddy Considine gives a superb, charismatic performance as Dai, Imelda Staunton is wonderful as Hefina, Jessica Gunning stands out in her role as Sian and Bill Nighy is remarkably understated as Cliff. As I watched Pride, I suddenly realised that I really cared about all of the characters. That had crept up on me - I didn’t appreciate just how involved I was in the story. This meant that I was in pieces by the film’s emotional end. However, I also felt uplifted - is this what they mean by a feel good film? Absolutely. Have you seen Pride? Did you enjoy it as much as I did? Whatever your thoughts on this film, do let me know in the comments section below!